Hungarian rabbi; born Aug. 2, 1850, at Zichyfalva; died July 24, 1895, at Alt-Ofen; educated at the gymnasia at Kecskemet and Nagy-Károly, the Talmud schools of Mayer Perls and Israel Hildesheimer, and the universities of Vienna and Tübingen. At the age of twenty-two he was called as rabbi to Szigetvar, and thence, in 1887, to Alt-Ofen. 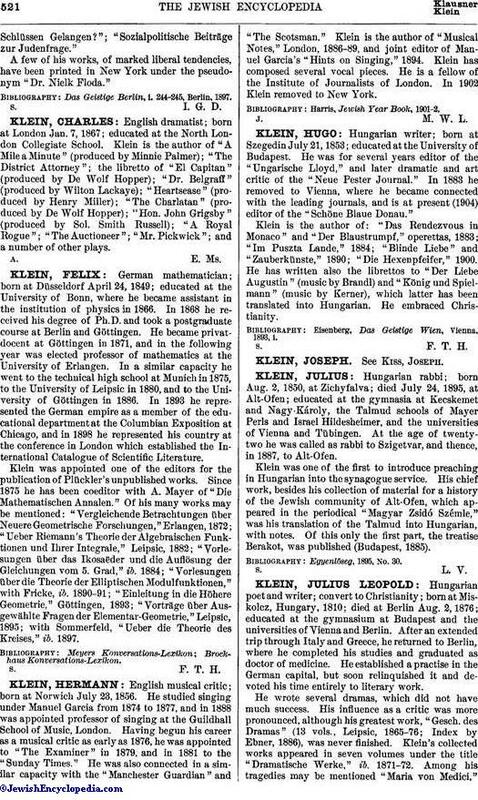 Klein was one of the first to introduce preaching in Hungarian into the synagogue service. His chief work, besides his collection of material for a history of the Jewish community of Alt-Ofen, which appeared in the periodical "Magyar Zsidó Szémle," was his translation of the Talmud into Hungarian, with notes. Of this only the first part, the treatise Berakot, was published (Budapest, 1885).